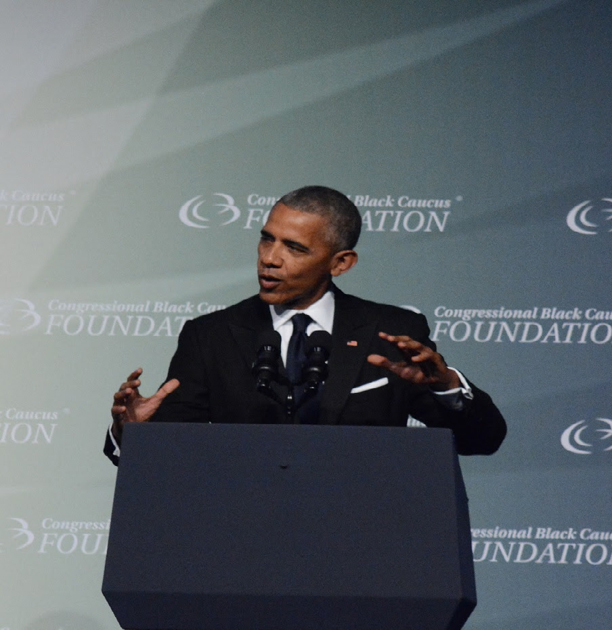 (TriceEdneyWire.com) - President Obama had barely begun his remarks before shouts of “I love you!” came from the audience, tributes upon his final speech to the Congressional Black Caucus Annual Phoenix Awards Dinner. As billionaire businessman Donald Trump attempts to discourage Black votes from Clinton and supporters of former Democratic candidate Bernie Sanders express hopelessness, some vowing not to vote, President Obama reminded what’s at stake as voters choose between Clinton and Trump. As a political maneuver, Trump had held a press conference finally acknowledging that Obama was born in the U.S. after he, for eight years, spread lies and doubt, claiming that he was born in Kenya. CBC members had responded with an impromptu press conference reminding voters of what they described as Trump’s bigotry and racism as he used the “birther” stance to undermine the legitimacy of America’s first Black president. Looking around the audience of thousands, Obama seized the opportunity to thank those who had elected him twice, despite staunch racism against him. Together, we fought our way back from the worst recession in 80 years, turned an economy that was in free fall. Helped our businesses create more than 15 million new jobs. Declared that health care is not a privilege for a few, but a right for everybody, secured coverage for another 20 million Americans, including three million African Americans. Our high school graduation rate is at an all-time high, including for African-American students. More African-Americans are graduating from college than ever before. Begun to work on reforming our criminal justice system by reducing the federal prison population, ending the use of solitary confinement for juveniles, banning the box for federal employers, reinvigorating the Justice Department’s Civil Rights Division, pushing to make sure police and communities are working together to make sure that our streets are safe and that our law is applied equally. And just this week, we learned that last year, across every race and age group in America, incomes rose and poverty fell. Folks’ typical household incomes rose by about $2,800 - which is the fastest growth rate on record. Lifted 3.5 million people out of poverty, including one million children -- the largest one-year drop in almost 50 years. The audience applauded wildly as he ticked off the successes, which he said have not been quick nor easy. He added that much of it is unfinished. Earlier, Clinton had spoken to the same audience warning the audience against the devices of “prejudice ad paranoia”.